In-Site Design is a small company fully invested in improving our clients living spaces though individualized well thought out designs. We handle projects ranging from new home construction, additions, renovations, interior design, kitchen and bath remodeling. We are able to provide a simple set of drawings that will get you a building permit, or a more extensive package that includes cabinetry details and finish selections. Renderings, computer 3 D models and Auto CAD drawings of your project are created as necessary to develop your project. 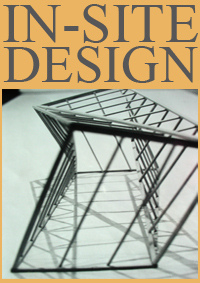 Our role in the design process is to take your wish list and turn it into a buildable set of drawings and documents. Our design process is a collaborative one in which we consult with our clients frequently as we develop the project, checking in to make sure that we are going in the direction that you envision. Please contact us and tell us about your project.